Don't Touch extended his unbeaten run to five by winning the William Hill Ayr Gold Cup in a tight finish under jockey Tony Hamilton. The 6-1 favourite beat 50-1 outsider Poyle Vinnie by half a length in the 25-strong field with Ninjago (33-1) third and Toofi (10-1) fourth. He became the first three-year-old to win the race since 2002. "He's a horse I've always loved and this is a race I've always wanted to win," said Hamilton. "He's done it a bit too well really as I was in front too soon but we've got away with it." The win in Ayr gave trainer Richard Fahey a Gold and Silver Cup double after Tatlisu beat stable mate George Bowen earlier on the card. 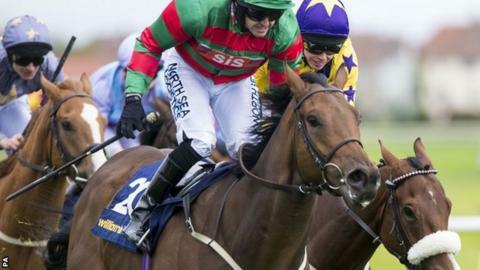 In all, Fahey won six races around the country - three of the winners, like Don't Touch, owned by financier Nicholas Wrigley and businessman Kevin Hart - which took the stable's winnings for the season past the £3m mark for the first time. Fahey said: "You need a proper horse to win this. You've got to be progressive and nearly be a Group horse." A remarkable performance this by Don't Touch considering it was only the fifth race of his late developing career - the first was on May 13 - and this historic Scottish cavalry charge is famously hard to win, for even the most experienced runner. It's only occasionally that big handicap races throw up something really special. In the last 25 years, Ayr's showcased the talents of the brilliant Lochsong (1992) and talented Coastal Bluff (1996), and indications are that Don't Touch is also on a steep upwardly mobile trajectory.